This is one of my favourite new quotes. It’s from Ira Glass of public radio’s “This American Life” in a recent public forum. Though I’m sure a few folks who own broadcast licenses would disagree, there’s an essential truth and an implicit hope here for the rest of us who are attached to the radio business one way or another. 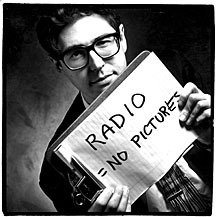 A 1997 photo of Ira Glass: in 2011, might we suggest that radio can have pictures too? Radio as we know it is changing in a way that we may not even recognize it a few years from now. Radio that emanates from the broadcast tower may even fade away—though I personally suspect it will be around longer than some pundits predict. But, even if those towers do go down, something similar will inevitably rise up from the ashes. I’m convinced that listener research can play a big role in understanding these changes and identifying new opportunities. But it will take a vastly different approach than most of the radio research that’s done today. How, and to whom, you ask the questions also has to change. You can’t expect to get the insights from the dinner-hour interruption of a random landline telephone call that you can get out of a two-way conversation with an engaged consumer. And that conversation could take place where the consumer listens to whatever they listen to, in an online/mobile community of which they are a member, or any other mutually agreed upon setting. The key is staying open to all the possibilities, with the resolve to be on the side of the survivors, wherever that might lead you.